They granted ICE this award even though in 1996 we strongly criticized the EPA about their unrealistic standards for awarding EnergyStar ratings based on faulty data. They suspended that program. In that same article we criticized the EPA for unrealistic rules about asbestos and radon, which continue to this day. 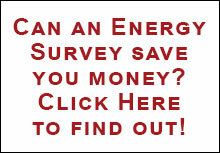 Now, they are at it again with their “Energy Star Congregations” program. To us, it seems that they have never spent much time actually analyzing houses of worship, whereas ICE has analyzed hundreds of them. Use fans when a room/area is occupied. Moving air makes people feel cooler during the heating season. “Tune-up” your heating, ventilating and air-conditioning (HVAC) system with an annual maintenance contract. We don’t like fixed-price service contracts because your congregation ends up betting against itself. The ENERGY STAR mark indicates the most efficient computers, printers, copiers, televisions, windows, thermostats, ceiling fans, and other appliances and equipment. Consumer Reports has been critical of this program. We think that most appliances have become more efficient and that EnergyStar more likely describes the higher-priced appliances. Properly sealed doors can prevent heat loss. It is more effective to keep warm air from escaping than to keep cold air from entering. In the winter, the warm air from your heating system will rise. Ceiling fans can actually help with both cooling and heating. We have measured this. Ceiling fans are ineffective because the temperature of the air in large rooms tends to be homogeneous. The Associated Pipe Organ Builders of America say that temperatures as low as 45oF will not cause damage to the organ. So normal setback ranges ~ 55oF to 60oF should not be an issue. Why not recommend 45oF? The Energy Star program for congregations also offers a Portfolio Manager for buildings that are used as places of worship. We tried this program and lost patience with it. The results are not going to be accurate. The only inputs are zip code, gross floor area, seating capacity, number of weekdays in operation, weekly operating hours, number of personal computers, presence of cooking facilities and number of commercial refrigeration/freezer units. Note that air conditioning is not included, and why would the number of personal computers matter in a house of worship? From our point of view, why are only material factors considered? Why is the most important factor not included… the building operator?